Given that it's British Sausage Week, and the fact that everyone loves a bit of sausage, there's no better time to pop open a bottle of red, or white, to make this British favourite sing. A week decicated to the diversity and quality of the great British banger, British Sausage Week celebrates the 188,270 tonnes of sausages consumed by Britons in the first half of 2013 alone - greedy lot, we are! In a nation of traditional comforts, us Brits have mastered the art of jazzing up simple foods with inspiration from international cultures - curry is now the nation's number one dish! So it seems the humble sausage isn't just a sausage anymore. From chipolatas to cumberlands, they come in all shapes and sizes and have become a vehicle for carrying any combination of flavours. From classic pork & leek to duck & hoisin, pork & apple to lamb, rosemary & garlic there is a sausage to suit any mood...except if you're a vegetarian...and no Quorn sausages do not count! Many would argue that perhaps a traditional British Ale or a West Country Cider might be the best match for a suculent sausage, but the right wine can also work a treat. Think rich, spicy Rhones full-bodied Southern French reds, juicy Zins and gutsy Malbecs. The bottom line? Whether it's white or red, it needs body, punchy flavour and a little spice to match the savoury meatiness of your snags (Aussie slang for sausages if you don't know it). And the best news? 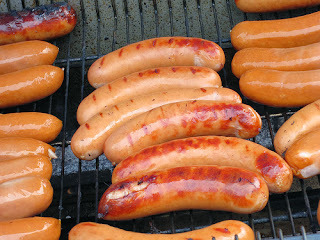 I've found 5 great sausage wines all under £7 (ok, all but one!) and tried and tested for sausage matching abilities! 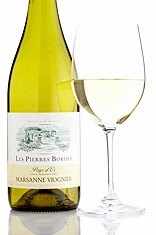 Fruity, fresh and rounded, this blended beauty of Rhone grapes Marsanne and Viognier from the South of France is a steal at £5.75. Ample body with flavours of apple, peach, nectar and spicy cloves, make for a delicious pairing with a simple pork & leek or pork & apple sausage, served simply in a one-pot roast style with apples, onions and sage. Another cheap and cheerful favourite from my friends at the Wine Society, this Grenache, Syrah blend from the area of Cotes-du-Rhone wines punches above its weight. Brimming with juicy red and black fruits and a peppery Syrah spice, it's a great match for simple, Provencal style dishes such as sausage and bean stew, or herby sausage cassoulet. Bright, vibrant and full of raspberry jam aromas will a little hint of vanilla, I can't think of a juicier red to sip with grilled beef sausages and buttery mash or a classic toad-in-the-hole, with a puddle of caramelised onion gravy. From well-known Argentinian producer Trivento, the sweet tannins balance the meatiness of the sausages and the smooth fruit driven palate makes for a comfort wine at a comfortable price! From the South of France, this typical blend of Carignan, Grenache and Mourvedre is rich and ripe with plum and black cherry fruit but a little stringency from the Mourvedre. When it's been open an hour or so, and at room temperature, this own-label beaut from our supermarket giant will nicely match roasted lamb, rosemary & garlic sausages with smashed potatoes. Ooh we can feel the delight already! One of my absolute favourite wines, I couldn't help but put it in my top five. If you're having an extra special sausage meal, then I recommend splashing the cash (ok, it's still under £10!) on this baby. From the Central Valley in California, this is bursting with blueberry and plum fruit, bags of spice and a hint of vanilla. For pure decadence, pour a large glass of this with a generous plate of the Great British Sausage Co.'s iconic banger, The Knebworth - organic vension from the Knebworth Estate (down the road from me) combined with caramelised onion and port. So go on people, share the sausage love this week! *The Wine Society is for member's only. Membership can be purchased online for £40, but it's a one off fee for life, so it's worth it! And, if you join now, you get £20 towards your first order!